Here, love for this local corner of earth and for nature inspires everything. The Conti Spalletti Trivelli family, which arrived in Emilia-Romagna from far-off Switzerland in the mid-1600s, settled in Tuscany some 130 years ago, just a few decades after the Unification of Italy, purchasing 650 hectares northeast of Florence, in a small corner of paradise with a breath-taking view out over the valley of the Sieve river. Cultivation of the grape and the olive grew in importance over these hills, and the many farmhouses spread over the property were restructured century after century and finally became today’s Colognole Country Wine Estate. Over all these years, the love of the Conti Spalletti Trivelli family for their land has never wavered; rather, they have passionately dedicated themselves, over 5 generations, to steadily improving their wines and olive oil, together with a hospitality programme that in the last 30 years has assumed impressive dimensions and has made a significant contribution to the area. Lying in the hills that rise from the right bank of the Sieve river, some 30 km. northeast of Florence, the Colognole Country Wine Estate is the felicitous outcome of a meticulous restructuring of the property’s 3 villas and 2 farm residences. In the heart of the Borgo della Fattoria, Maggetto is one of the benchmark accommodations for guests at the Country Wine Estate; it includes rooms, the restaurant, and a breakfast room. The 18th-century furnishings were completely renovated in 2006, and eloquently reflect the traditional Florentine style. Villa Fattoria is a magnificent 17th-century villa in the centre of the borgo, directly facing Maggetto. Inside are the Grappolo, Acino, and Vinacciolo apartments, plus the estate’s reception desk and the tasting’s room. A luxurious, well-tended garden provides a picturesque frame. About 200 metres from the Borgo della Fattoria, Podere Mago has been re-structured into 2 apartments, Mago and Fata. A large and exclusive garden bordered by cypresses and boxwood hedges surrounds the podere, giving it an air of fascination and peaceful isolation. Villa Il Frantoio is one of the villas best-loved by guests here for its dominating position over the Val di Sieve. It lies some 300 metres from the Borgo della Fattoria and is completely surrounded by olive groves and meadows. Inside are two apartments, Pendolino - ideal for large families or groups of friends - Leccino, a spacious studio with a separate entrance. 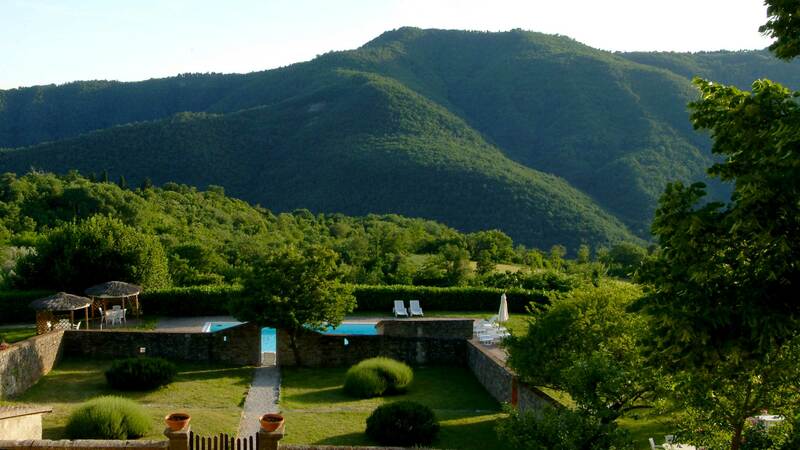 Villa Frantoio is surrounded by an extensive garden with a private swimming pool and BBQ nook. Dating back to the early 17th century and constructed around a medieval tower, Villa Il Palagio is still the residence of the Conti Spalletti Trivelli family for part of the year. Surrounded by a spacious garden, the two-storied Villa lies some 300 metres from the borgo; it has a swimming pool, tennis court, and table soccer. The family’s historic winecellar lies beneath it.